Figure 2 shows GOES-14 1-minute imagery from 1902Z to 2130Z. Notice the significant clumping of cu, as noted in the MD, that occurred between 1900 and 2000Z in northeast South Carolina and eastern North Carolina. Between 2000 and 2130Z, convection initiated out of these two areas, as is seen in the 1-minute imagery. Fig. 2: May 23, 2014 1902-2130 UTC GOES-14 1-minute visible imagery. 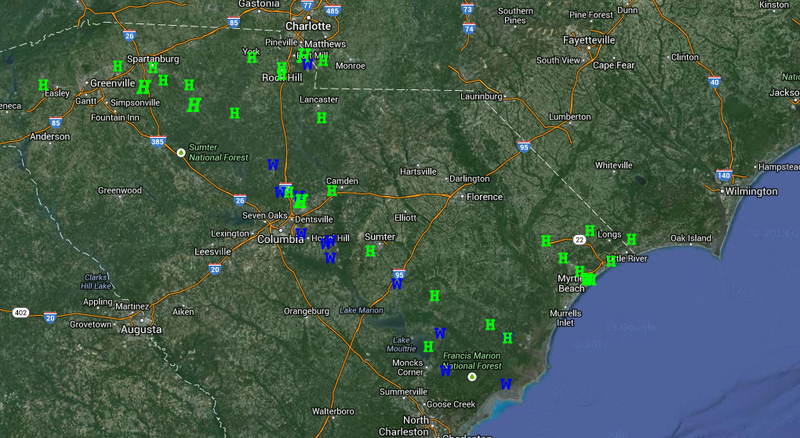 Severe hail was reported with the convection in South Carolina (Fig. 3). Fig. 3: June 17, 2014 SPC storm reports.